Life without Windows or OS X: instant messaging (IM) client for Linux. Gaim is a multi-protocol instant messaging client for Linux, BSD, MacOS X and Windows. 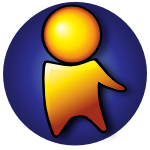 It is compatible with AIM and ICQ (Oscar protocol), MSN Messenger, Yahoo!, IRC, Jabber, Gadu-Gadu and Zephyr networks. Gaim supports many features of the various networks, such as file transfer, away messages, typing notification, and MSN window closing notification. It also goes beyond that and provides many unique features. A few popular features are Buddy Pounces, which notify you, send a message, play a sound, or run a program when a specific buddy goes away, signs online, or returns from idle; and plugins, consisting of text replacement, a buddy ticker, extended message notification, iconify on away and more. Gaim runs on a number of platforms, including Windows, Linux, and Qtopia (Sharp Zaurus and iPaq). Gaim integrates well with GNOME 2 and the KDE 3.1 system tray, as well as Windows' own system tray. This allows you to work with Gaim without requiring the buddy list window to be up at all times.